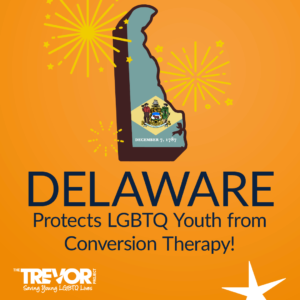 Wilmington, DE—Delaware Governor John Carney today signed SB65, a bill that protects LGBTQ youth from conversion therapy and establishes a sexual orientation counseling task force. The discredited practice of conversion therapy falsely claims to be able to change people’s sexual orientation and gender identity, and is widely opposed by prominent professional health associations including the American Medical Association, the American Psychological Association, and the American Academy of Pediatrics. Supported by The Trevor Project, the leading national organization providing crisis intervention and suicide prevention services for LGBTQ youth, Senator McDowell filed SB65 in 2017. The organization supported the bill’s passage through its “50 Bills 50 States” initiative by supporting legislators in their study of similar legislation and by directing its network of Delaware volunteer activists to contact local legislators, encouraging them to support this critical bill to protect LGBTQ young people. The organization also worked with national partners such as the National Center for Lesbian Rights (NCLR) and Human Rights Campaign (HRC) and to support the bill’s passage. By building coalitions, these national partners have been wildly successful at preventing conversion therapy for thousands of LGBTQ youth. The Trevor Project is invested in ending conversion therapy in every state because evidence shows youth who experience rejection from their family are more than 8 times more likely to attempt suicide than youth from accepting families. According to the Williams Institute, more than 700,000 LGBTQ people have been subjected to the horrors of conversion therapy, and that number grows by thousands each year. We estimate that nearly 80,000 LGBTQ youth will be subjected to forms of conversion therapy in the next few years. The Trevor Project’s “50 Bills 50 States” campaign works to introduce legislation to protect LGBTQ youth from conversion therapy in every state in the country. So far bills have been introduced or successfully passed in 34 states. People can sign up to join “50 Bills 50 States” by texting “TREVOR” to 40649.